Once you’ve found a dress style that’ll suit all your bridesmaids and picked a colour and fabric that doesn’t make them scream with horror it’s time to turn your attention to the smaller details. Your own bouquet’s easy enough to construct with some photos and a little imagination – but what on earth should your attendants carry? Because bridesmaids carry their bouquets for most of the day, you’ll need to choose flowers that are predominantly hard-wearing. Plants with fragile stalks, such as gypsophila or lily-of-the-valley, will look gorgeous but will start to droop after much clutching. Go for a mixture of sturdy-stalked blooms such as gerberas and add plenty of greenery to pad things out. 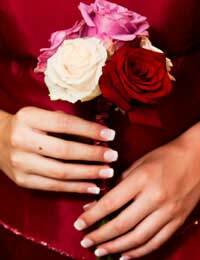 You’ll want to keep things looking good for the photos, so be wary of flowers that could spoil the dresses. Anything with a great deal of pollen, such as Asian lilies, can create nasty stains on skirts, while blooms with sap-filled stems leave sticky marks.The main bouquet should be big, but bridesmaids should never upstage their bride, so make sure the posies prepared for your attendants are smaller than your bridal one. Choose one or two of the main flowers in your bouquet or in the other floral arrangements to serve as a centrepiece, then build around these. Co-ordinating the colours used in the bridesmaids’ bouquet is a tricky one – you’ll need to ensure they complement the bride’s bouquet, co-ordinate with the flower arrangements in the venues and avoid clashing with the dress fabric. Give your florist a swatch of the cloth you’re using so they can match up colours more easily. Don’t go for too much colour in a small bouquet – stick to no more than two different shades, accompanied by white flowers and foliage, to stop the arrangements appearing too ‘busy’. Even if you’d rather have enormous, exotic out-of-season roses or lilies in your own bouquet, consider switching to seasonal flowers for the bridesmaids. Not only will it be a nice representation of the time of year you’ve chosen for your big day, it’ll work out cheaper to buy blooms that are readily available at the time. Everything’s in bloom during spring, but good, strong-stemmed flowers for early bouquets include tulips, daffodils and hyacinths. Summer’s all about roses, so make the most of them in all your bouquets if you’re a June bride. Gerberas and sunflowers are striking choices for autumn, or go dramatic in winter with orchids. If you’d rather go for something less fussy or old-fashioned than a full-on bouquet, consider giving your bridesmaids single flowers to carry. Large, showy sprays of arum lilies, gladioli or lilac will create a modern effect, while single roses are romantic without being too traditional. For those who dislike having their hands full, corsages – small arrangements a little like a man’s buttonhole - are a popular option. Corsages can be pinned to breasts, worn on the wrist or added to hairstyles instead of being carried, making them a good option for young children who might otherwise ruin their bouquets. As a general rule, the simpler the arrangement you choose for the bridesmaids, the easier they’ll find things among all the other duties they’re expected to carry out. Keep posies compact, neat and free of thorns, and they’ll all be clustering round with outstretched arms when it’s time to throw the bride’s bouquet.